How to Knit a Scarf. To learn how to knit a scarf is easy. 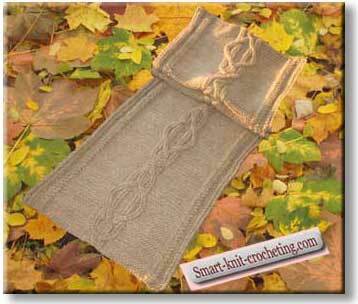 It is one of the simplest projects in knitting. But at the same time a scarf is one of the most important and multi functional pieces of a modern women wardrobe. A scarf indicates the way you treat yourself. If a scarf is just a strip of dull and inexpressive knitted fabric, every one will be aware that its owner doesn't love herself. A little bit of fantasy and this stylish addition will completely change your look. There are a lot of different scarf designs. From the very simple to extremely intricate. But the majority of them is based on the simple rectangular. Hence, to knit a scarf simply means "to knit a rectangular". Will you say that it is "dull and inexpressive"? You are absolutely right. But don't be in a hurry. A little bit of fantasy and you will have a stylish addition to your wardrobe. 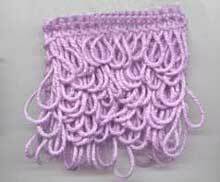 ,We will begin to learn how to knit a scarf from its simplest possible variant. For example, let our scarf is a rectangular 8 inches (20 cm) wide and 50 inches (150 cm) long. Here are the steps you have to follow while knitting a scarf. Choose dimensions for your knitted scarf. For our example a scarf is 8 in (20 cm) wide and 50 in (150 cm) long. 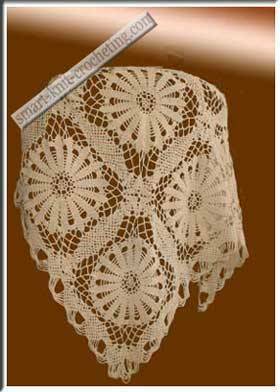 Choose a stitch pattern you would like to use for your scarf. Knit a gauge swatch for the stitch pattern chosen. For our example a swatch was 16 sts = 3 in (7.5 cm), and 30 rows = 4 in (10 cm). 3. Calculate the number of stitches and rows you need, to knit a scarf. To begin a rectangular 8 in wide, you will need to cast on: 5.33 sts/in x 8 in = 42.6 (round to 43) stitches. To make a scarf 50 inches long you have to knit: 7.5 rows/in x 50 in = 375 rows. Important note: Knit your own gauge swatch! Don't use mine, please. Most likely your gauge will be different than mine! That's it! Now you have idea about knitting a scarf. It is time to invite your fantasy and to create something more stylish than just a rectangular. 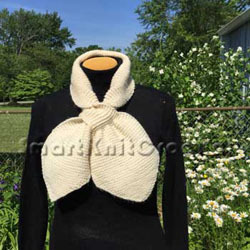 But even a simple rectangular with proper yarn, stitch pattern, and color can be a stylish one-of-a-kind masterpiece. Here is my warm and functional winter "rectangular". A simple rectangular and nothing else. :-) Patterns for this knitted scarf are available at the Knitted Scarf Pattern page. Good luck with your knitting!